A survey can include a variety of questions or statements that measure agreement, comparison, frequency, importance, likelihood, or quality. As you progress through a survey, your answers will be saved automatically. You can change your answer at any time before submitting the survey. On the My Learning page, locate the survey and click the Take Survey button. To begin the survey, click the Get Started button. All responses are submitted anonymously. 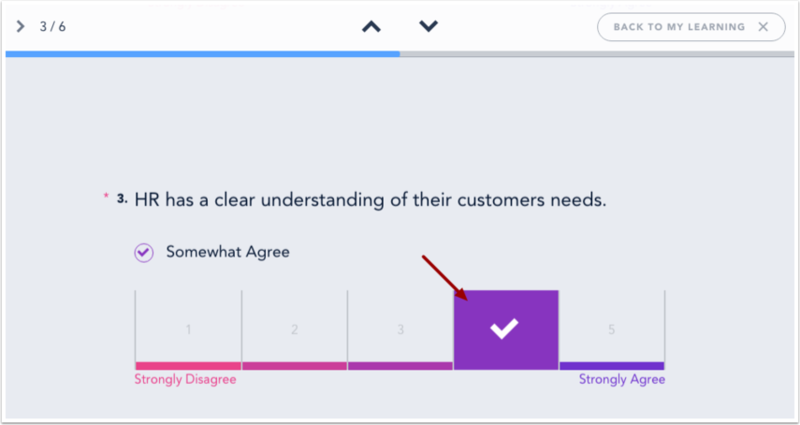 When you begin a survey, the bar at the top of the survey will indicate your progress . You can also view which question you are viewing and how many questions there are total . To return to the previous question, click the up arrow . To advance to the next question, click the down arrow . To complete the survey at a later time and return to My Learning, click the Back to My Learning button . To open the navigation sidebar, click the Arrow icon. In the navigation sidebar, you can view all questions in the survey . To view a question in the survey, click the question title. Answered questions are marked with a checkmark . Required questions are marked with an asterisk . To close the navigation sidebar, click the Collapse icon . Survey questions are displayed one at a time. A survey may include both optional and required questions. Required questions are marked with an asterisk . 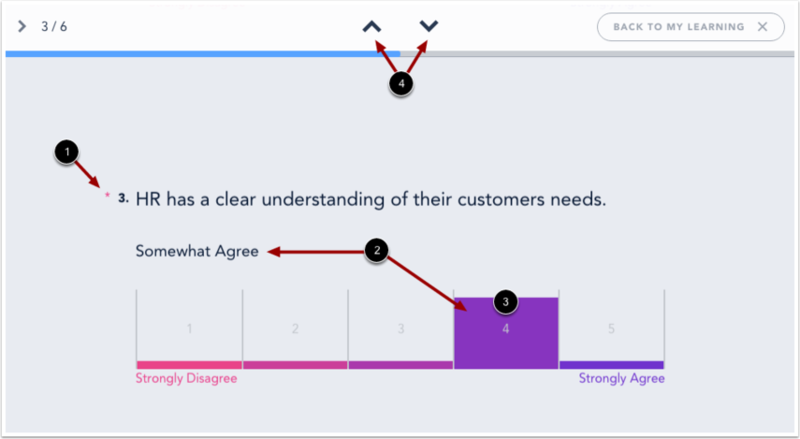 Hover your mouse over the response scale to view each of the answer choices . Click a number on the response scale to select your answer . 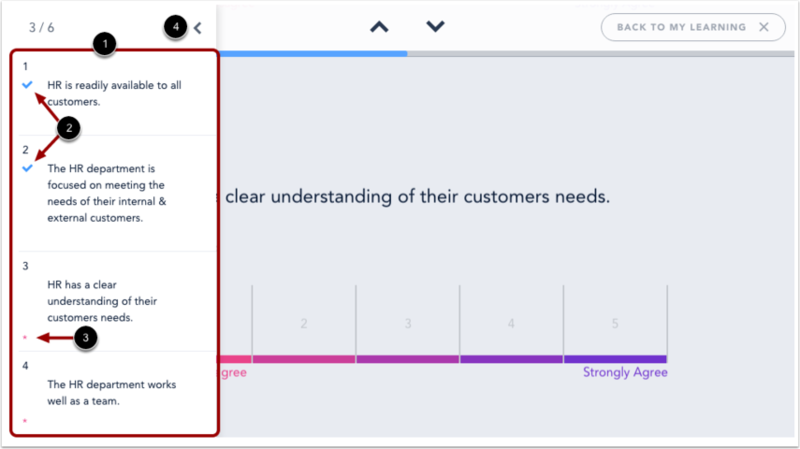 Once you choose an answer on the response scale, Bridge will automatically move to the next question. To manually return to the previous question or advance to the next question, in the top navigation, click the up or down arrow . You can also use your mouse to scroll through the questions. Your answer will be indicated by a white checkmark in the colored bar chart on the response scale. To submit the survey, click the Submit button. If your survey has required questions, you will need to answer all required questions before you can submit the survey. Click the Show Me button to review skipped required questions. Previous Topic:How do I view my survey invitations? Next Topic:How do I use the Learning Library? Table of Contents > Learners > How do I take a survey? How do I use the Learning Library?